Just as the fossil record reveals clues about the conditions in which prehistoric animals and plants once lived, newly discovered genetic signatures in bacterial evolution may one day allow hospitals, doctors and scientists to know more about the environment where a bacterial infection originated. 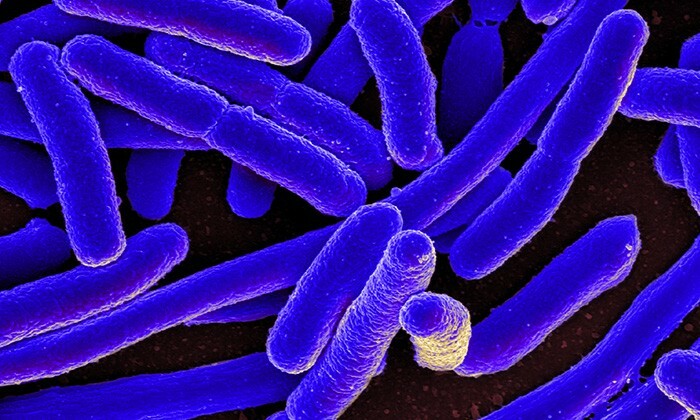 Colorized scanning electron micrograph of Escherichia coli, grown in culture. Credit: NIH/NIAID. Jeffrey Barrick and his colleagues at The University of Texas at Austin, Michigan State University and the University of California, Irvine made the discovery when they were conducting experiments to see how the genome of a certain species of bacteria evolves over time as it adapts to life at different temperatures. Their results suggest that it might be possible one day to sequence a microbe's genome and determine what kind of environment its ancestors grew in months earlier, providing a potentially valuable forensic tool. The researchers examined 30 populations of E. coli bacteria, six populations grown in each of five different temperature regimes, ranging from 20 to 42 degrees C (68 to 107 degrees F). After the bacteria had evolved for 300 days, which translates to 2,000 E. coli generations, the researchers compared their genomes to see how each population had changed at the genetic level. They found that two bacterial populations grown under the same temperature regime tended to have mutations in the same set of genes, while populations from two different temperature regimes tended to have mutations in different sets of genes. In other words, the genome of any individual bacterium contained a signature that could be correlated to the specific temperature regime that its ancestors experienced, even though their environments were identical in all other respects. On the one hand, the results were predictable—there is ample evidence that species adapt to their environments through genetic changes that manifest as convergent differences in physical and behavioral traits. But what was unexpected was that within each temperature regime, several independent bacterial populations each made changes to the same small number of genes, essentially preserving a unique signature of the temperature they had evolved in. "We were surprised to see such a clear genetic signature," says Barrick, an assistant professor of molecular biosciences and co-author of the new study. "There are so many different genes that could have been modified to adapt to each environment that we might have just seen noise. So it was a surprise that selection was concentrated on so few genes." The results are published this week in the journal Proceedings of the National Academy of Sciences. The work was made possible by a unique repository of bacterial samples created and maintained by study co-authors Richard Lenski, a professor of microbiology and molecular genetics at Michigan State University and Albert Bennett, a professor emeritus of ecology and evolutionary biology at the University of California, Irvine. 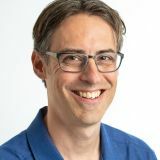 "Jeff Barrick developed a terrific bioinformatic pipeline for comparing the genomes of the E. coli bacteria that evolved in this experiment with their ancestor's DNA," says Lenski, referring to the breseq software program created by the Barrick lab. There is one caveat that might limit the usefulness of a forensic tool based on these results. The researchers let a different E. coli population continue to grow for several more years at one temperature and found that as these bacteria evolved, they developed some of the same mutations that were initially unique to populations from other temperature regimes. So the genetic signatures of specific temperatures might only remain unique enough to predict the past environment for a limited time. Barrick, Lenski and their colleagues reported last year in the journal Nature that over thousands of generations of E. coli, most new genetic mutations that were passed down were beneficial and occurred at much more variable rates than previously thought. The other authors of this latest study are Daniel Deatherage and Jamie Kepner at The University of Texas at Austin.